Click here to vote for Shelby. Shelby Patterson can command a stage with a single look. That fierce presence, plus her laser-sharp focus and ball-of-fire energy, have made her a standout in both the contemporary and commercial worlds. "I'm always performing out to the audience," Shelby says. "People say things like, 'Oh, that's the Shelby face—she's in the zone.' "
And she's got the technique to back up that onstage confidence. Shelby started training in several styles at age 3 at Orange County Performing Arts Academy. She grew up as a classic comp kid, constantly competing and attending conventions. At 12, she got even more serious about her training, adding classes at the Dmitri Kulev Classical Ballet Academy to her busy schedule, and later she joined the prestigious pre-professional contemporary group Westside Dance Project. In 2016 alone, she won Radix Dance Convention's National Teen Core Performer title, was a Top 10 Teen Finalist at The Dance Awards, and was a Pulse Protégé winner. And this past June, she graduated from the Orange County School of the Arts—as co-valedictorian of the commercial dance conservatory. NBD. 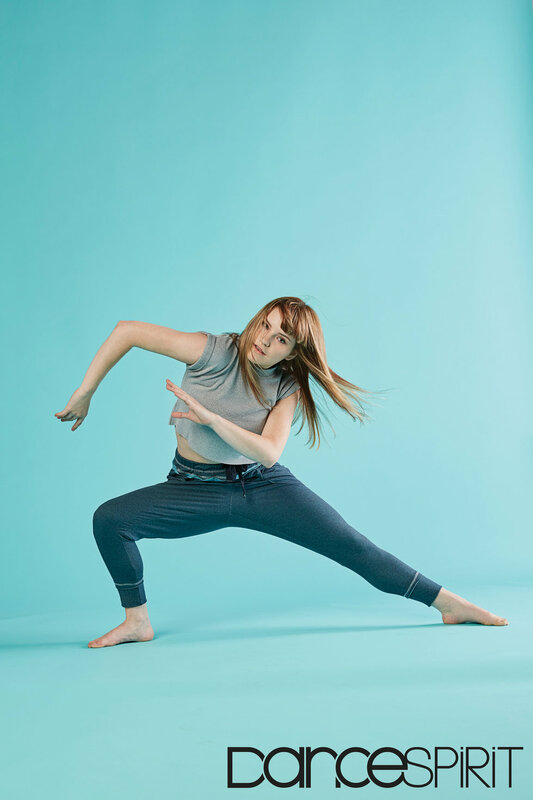 Shelby dreams of a career that includes both commercial and contemporary dance, and she's open about what that path might look like. "So many people tell me you have to choose one," she says. "But, honestly, I'm really passionate about both realms. I don't want to limit myself." Whatever route she ends up taking, one thing's certain: She'll put her whole heart into anything that comes her way. "I care a lot," she says. "Dance is how I show who I am. If someone meets me, but they haven't seen me dance yet, they can't fully grasp who Shelby is." If she could have a superpower, it'd be… "Either being like Elastigirl, super-flexible, or the power to never have sore muscles." Nicknames: Tubby or Bangs. "Tubby, because I danced with Alyssa Allen, and one day she accidentally called me Tubby. It just kind of stuck and now everyone calls me that. And Bangs because I've had them ever since I was in fifth grade, so everyone knows me as the girl with the bangs." Something no one knows about her: "When I was in elementary school, I played Charlie in Charlie and the Chocolate Factory."